Keeps the magic going all the way to the finale. Pretty Sammy TV Series, the show that is everything Sailor Moon isn't, or should that be everything Sailor Moon was never meant to be? Anyway, Pretty Sammy TV Series, renamed Magical Project S, is currently available on eight subtitled VHS tapes through Pioneer Entertainment on VHS being released domestically in the USA by Pioneer. The first and eight volumes contain 4 uncut episodes, while volumes two through seven contain 3 uncut episodes each. Magical Project S is by far the best of the Tenchi-Muyo! : Pretty Sammy realities because the series beings, for the first time, a since of continuity to the Pretty Sammy universe. It does this by adding inter-connected stories that wrap-up the loose ends and events from the episodes that came before. This is a common staple in anime, but when compared by the mindlessness of the Pretty Sammy OVA, any sense of continuity makes for a world of difference. The general story goes something like this, Sasami Kawai is a normal middle school student just having fun with her friends and being a normal kid with blue hair. That is, until she is chosen by queen-to-be Tsunami to bring order to Earth. Once that happens, Tsunami will be crowned queen of Juraihelm. Easy enough, if Sailor Moon can do it each episode, why can’t Pretty Sammy? Well, in shojo nothing ever goes easily. Tsunami's rival, Ramia, wants to be queen instead, so she creates her own Magical Girl, using Sasami's best friend, Misao. Now, the naive, and totally embarrassed, Sasami must transform into Pretty Sammy to combat Pixy Misa time and time again until the tides finally turn and either Ramia or Tsunami is crowned Queen. Pretty straight forward, but when it comes to politics, is anything ever evenly sided? At first glance Magical Project S may seem like a Sailor Moon cop-off, and it was meant to be, but the series sets itself apart form al the other ‘Magical Girl’ genre greats by using reincarnated versions or characters of the highly popular series, Tenchi-Muyo! Here are a few highlights that make Magical Project S a winner for any anime fan: meaningful battles, excellent supporting characters, Sasami's training, Mihoshi as a teacher, different and loveable parents (ie: the Karaoke singer mom is gone and Sasami has a very cool dad now), the El-Hazard connection, less appearances from recognizable Tenchi characters, and, best of all, the show actually has an ending! 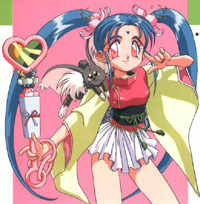 My only real gripe is the title Magical Project S. It doesn’t exactly make me think of Pretty Sammy. In fact, it seems to be a combination of the titles Idol Project and Sailor Moon S with the word ‘Magical’ tacked on to the beginning to represent the magical nature of the show. In case you are curious, I once was told by Chad Kime that the reason for the name change was due to the fact that the OVA didn’t sell well in stores. And retailers told Pioneer that they would not buy the TV series if it wasn’t renamed. But, just to ease your mind, the opening credits still have the original Japanese Pretty Sammy logo. Overall, if you want to avoid Tenchi In Tokyo entirely, then give Magical Project S a try. You wont' be disappointed.